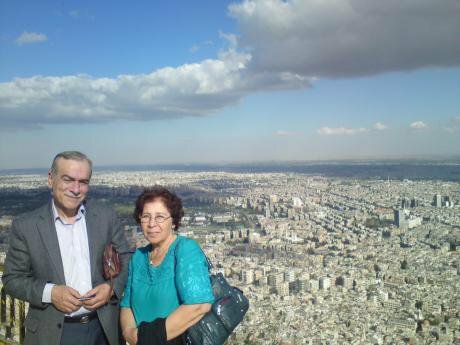 Fadwa Mahmoud and Abdulaziz Al Khayer looking over Damascus. Photo courtesy of Fadwa Mahmoud. All rights reserved.Her name is Fadwa Mahmoud. She is a lifelong Syrian political dissident, born in 1945 and a veteran member of the banned Communist Action Party (CAP). In the past year and a half as an exile she has become a mother figure to fellow political dissidents who, like her, have sought refuge in Beirut (Lebanon) from Bashar Al Assad’s security forces. But above all, Fadwa wishes to be known as the wife and the mother of two leftist opposition activists who were forcibly disappeared two years ago near Damascus: Abdulaziz Al Khayer (63), head of the CAP and a leading figure in the opposition group 'National Coordination Body for Democratic Change', and her son Maher Tahan (31), a young civil activist who followed in the footsteps of his mother to fight for a democratic Syria. Along with them disappeared Iyas Ayash. The three are part of the same political coalition. They were abducted by the Air Force Intelligence on their way from the airport into the city, on September 20, 2012. They were on their way back from a diplomatic visit to China, returning to participate in an opposition conference (Syria salvation conference) at the heart of Damascus. The participants were given guarantees of safety by Russian, Chinese and Iranian foreign ministries - the powers with influence over the regime. Assad himself denied on an interview in 2013 that his secret police had taken them, but Fadwa insists it is the dictator’s forces who have them. She does not need my questions to begin talking: it is clear she has to tell their story. “We know everything that happened because there were five people in the delegation that came back from China. They were driving two separate cars back from the airport. Abdulaziz and Iyas were in one car, driven by Maher, who had gone to pick them up. The rest were in the other car. The three of them disappeared, the activists in the other car were able to pass the checkpoint and gave us information”. Mahmoud is soft-spoken and at times her emotions surface, but her voice doesn’t break. She explains that, when the delegation landed on the day of their disappearance, Abdulaziz Al Khayer was interrogated on his own for about half an hour, inside the airport. The officer that interrogated him (she calls him “captain”) let him go with the pretext that they were looking for someone of the same name. Mahmoud lets out a small smile: the explanation to her seems absurd, because Al Khayer is very well-known in Syria. “While he was being delayed inside, I called Maher, who was waiting in the car. That’s when he told me: ‘Abdulaziz just came out’. Ten minutes later, Iyas’s mother also called Maher, on their ride back to the city, but the phone was by then out of service”. Fadwa believes the abduction happened in this small window of time, immediately after they left the airport. “In 2012, the highway from the airport to Damascus was totally under the control of the regime. There were no ‘armed gangs’, as the Government says”, assures Mahmoud. Everyone waited for Abdulaziz to come out when he was initially delayed. The first car to leave was carrying the rest of the delegation. Iyas, her son and her husband were driving behind. “The fact that the first car was at the front and didn’t encounter any problems shows that the road was safe”. They passed a checkpoint on the road, near the airport. The party members who were in the first car told her the officer they saw at the checkpoint was the same that had interrogated Abdulaziz half an hour prior. The car her son was driving was forcibly stopped. And they were never seen again. The conference they intended to attend, however, carried on, and Mahmoud went there and spoke to the Russian ambassador. “I told him: ‘You are responsible, he came here under your protection”. He promised to work on it, but after two months without any new information, Mahmoud went to talk to him again, this time taking Iyas Ayash’s mother with her. “I told him I was very worried about their safety, and he answered ‘We are worried as well’. This made me panic; I asked him whether they had been killed. He answered they were alive, but the circumstances were very difficult”. She thinks the regime didn’t detain them publicly in order to avoid a diplomatic clash with its allies. “The pressure of these countries was the only reason why the meeting was happening”. Mahmoud hasn’t talked to the Russians since. “Their attitude was disgusting. They did nothing to guarantee their safety”. She spoke at the European Parliament last year, and she says an MP took an interest in her story and spoke to the Syrian government. To no avail: the regime has always denied the presence of the three comrades in their prisons, Assad himself denied Abdulaziz's abduction in an interview. They claim the rebels have them. “The state media said armed gangs kidnapped them so many times that the rebel battalion controlling the Damascus countryside felt the need to release a statement saying they would never detain someone like Abdulaziz, because their causes are not opposed. I have some inside sources who have told me they are okay, I’ve had information this year that they are in the hands of the regime”, she explains. “I want to send an international plea of solidarity, to put pressure on the regime so that they admit they have them”. She lives in perpetual fear for their safety, “never knowing what will happen to them tomorrow. Some days I find it difficult to stay emotionally stable”. Fadwa's dreams are now very humble, she wants to have the 'privileges' of the loved ones of political prisoners: “At least they know for certain the fate of their loved ones. They know where they are kept, and sometimes they can visit them”. Fadwa Mahmod, or Khalto [aunti] as she is lovingly known by the Syrian exiles in Beirut, is no stranger to the horrors and torture under regime detention. She was imprisoned herself from 1992 to 1994, for being a member of the Communist Action Party. Her two sons were 9 and 6 at the time. “My brother was at the time head of the prison I was kept in”: he headed the Investigation Branch in Political Intelligence. She lived “in the worst humanitarian conditions possible”. This made matters worse for her. Her brother fely obliged to prove his loyalty by treating her particularly badly: “I was detained in my pyjamas and I lived in them for a year and two months, the time I spent in the basements of the branch before I was transferred to a prison”. Other detainees were allowed clothes, and the activists who were arrested with her only spent 4 months in security before a transfer to prison, in which conditions are relatively better. When she came out, her priority was the children. But, “People were saying I was a bad mother for getting into politics, leaving them alone”. Abdulaziz Al Khayer, who had spent 10 years living underground and had been arrested the same year as her (1992), was sentenced to 22 years in prison and would only be released in 2005. Mahmoud never stopped her political activity after prison, despite many of her comrades giving up on the cause. “You can see that with my son Maher. I never pushed him, but he took my example”. Why pick on Abdulaziz Al Khayer? Why did the regime make them disappear? Fadwa believes Al Khayer was a potentially unifying political figure in Syria, and thus a genuine threat to Bashar Al Assad. “The regime was terrified of Abdulaziz. The Russians were saying he could become a reconciliatory head of state. He opposed the call to arms and constructed a civil, democratic argument that agreed with both protestors and those silently fed up with the regime yet fearful”. As a prominent figure of the opposition, he is well-known, and has always maintained a non-sectarian discourse which got him popular support across social fault lines. “He influenced the generation of the uprising”, she explains. “He used to be able to sit with them, as if he was their age”. Now she’s had to leave the country, as well as her other son. “The house is now being auctioned. Abdulaziz doesn’t even have a home to come back to”. Fadwa at protest for the freedom of detainees(20/9/14) 2nd anniversary of comrades' enforced disappearance. All rights reserved. The worst part for those who remain outside is never knowing what can happen to the detainees. Since there is no possibility to negotiate with the regime, it is hard not to succomb to a general sense of despair. “This is one of the most monstrous things that they can do to the Syrian people”. There is very little organised support for the families of the detainees and the forcibly disappeared: “We are all scattered and suppressed since the war started”, explains Mahmoud. “The wife of Iyas calls me all the time. She is psychologically very low”. The regime punishes family members. Yara Faris was detained for several months after her husband, Maher, disappeared. “Six months ago I was able to visit Yara, my daughter-in-law. Her conditions were the height of dehumanisation and humiliation”. She arrived at 9.30 in the morning and was made to wait until 13.15, for a 10-minute visit. “She was strong, but her situation was bad. They kept her in a cell with prostitutes, to humiliate her”. In the meantime, the guard never stopped harassing Fadwa while she waited. “He kept asking who I was, despite the fact that he knew. I only answered ‘I am a Syrian citizen’. He then asked me why I insisted on making trouble. I told him, ‘No, you are the ones making trouble’”. Fadwa hasn’t given up in getting Iyas, her son and her husband out. Despite her tired eyes, her pride shines through when she speaks. Last Saturday, on the second anniversary of their detention, Fadwa organised a demonstration calling for their release in Beirut, along with other political activists. “I’m not going to waste any of my time. I will use all my energy to get them to safety. I am clawing at the sky, and I will keep clawing for as long as I live”.